I recently read a folktale called, The Monkey and the Crocodile. It involves a monkey who befriends a crocodile by giving him mangoes. However, the greediness and evil wife of the crocodile, almost got the monkey killed. Even though the crocodile is much stronger and dangerous than the monkey, he escapes unharmed because of his ingenious plan. The moral was, staying calm and cautious can help you out of any situation. This story also inspired me to make my own remixed version of the story with an alternate ending. After reading the folktale, I decided to write a script. this script includes 2 acts. Act 1 is the beginning, and act 1 has two parts. Act 2 was based on the what moral decision the monkey makes. If the monkey decides to be cautious and not panic, he will escape unharmed. Consequently, if the monkey decides not to be cautious and panic, he will end up with a tragic fate. After creating my script, I decided to create a storyboard of my version of the story. The website I used was, storyboardthat.com. 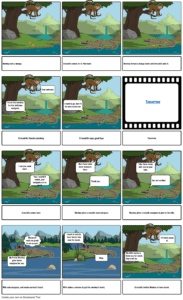 It basically showed a comic strip of my version of the folk tale. It also include 2 acts and 2 endings. I had fun making it. Finally, I animated of my story. I used Scratch to make my characters come to life. My animation is also interactive, and the viewer can choose which ending they want. I had fun making this animation, even though it was hard work. 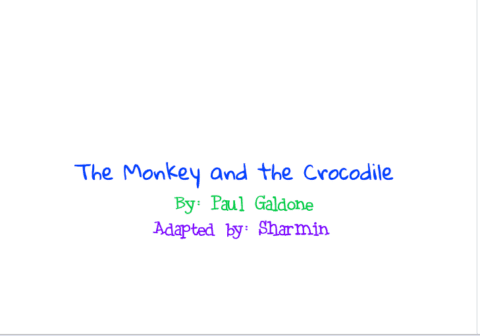 The Monkey and the Crocodile– Remixed by Sharmin is licensed under a Creative Commons Attribution-ShareAlike 4.0 International License.